The book is very informative. Proverbs are selected carefully for easy understanding. The english is very simple and easy to remember. the book is very useful for students. The author should be thanked for such a low pricing which will help the students very much. I never came across such a nice book in the recent times. There are 100+ proverbs. Liked it very much. Very useful for my studies. Nice book. Some proverbs were never heard before. Good knowledge for persons who reads this. Simple and easy to understand. Language is also easy. I could remember the meanings of proverbs from the explanation given. Good book. 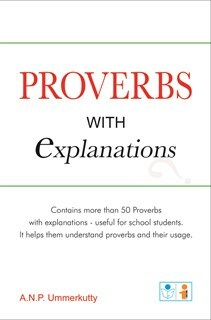 Never knew the meaning of proverbs before reading this book. Easy to understand and remember.